Netflix expanded its service to 130 new countries in January, but when it comes to international growth, the company will be reaping the benefits for years, according to Morgan Stanley. Netflix already counts on growth overseas for most of its subscriber additions. The company predicts it will add 2.5 million subscribers in the current quarter, 500,000 of which will come from the U.S. But in a research note Monday, Morgan Stanley’s Benjamin Swinburne said it takes about three years for Netflix to start to ramp up subscriber count in a new market. “In all markets three years or older, (Netflix) has reached well above double-digit penetration and is generating profits,” Swinburne said. The potential for international expansion is a key part of Swinburne’s case that Netflix shares are worth about 25% more than they currently fetch. He reiterated Morgan Stanley’s overweight rating on the stock with a $125 per share price target. 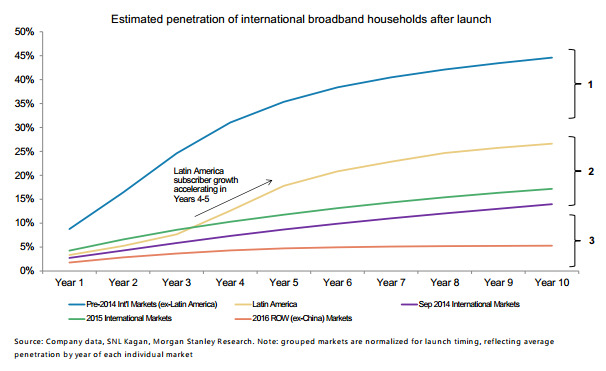 In the chart below you can see the big ramp-up in Latin America after the third year. Also supporting his bullish case for Netflix, Swinburne mentioned increasing the value of each of the existing subscribers. Netflix has raised its prices, but still has more than half of its US subscribers paying below the current rate because they signed up before the latest increases. It plans to spend the rest of 2016 rolling those members into the higher-rate plans. “With domestic (average return per user) growth poised to accelerate as more grandfathered pricing expires in 3Q16, we expect gross profit per sub growth and gross margin expansion to re-accelerate in 2H16 and beyond,” Swinburne wrote. 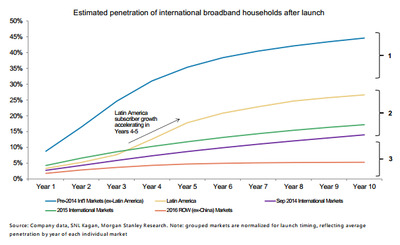 Increasing the return per user only helps increase the upside potential Netflix created by expanding into new countries. And when you factor the price increase some grandfathered users will experience later this year, there is more than one way the company can increase its revenue per user. More revenue means continuing the company’s chart-topping performance of 2015 could be possible, according to Swinburne. Shares of Netflix ended Monday’s session up 1.2% at $100.74, and but are still down 8.4% in 2016.